Smart collarless blazer jacket. 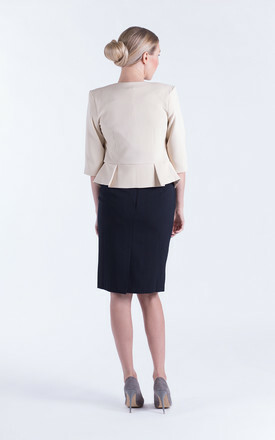 Well tailored and fitted semi-peplum style creates a flattering curve. Bracelet-length sleeves. Perfect finish to any outfit for interseasonal occasions. Wear it over a matching dress. High quality stretchy fabric. Fully lined. Shoulder to Hem length: approx 49 cm. Sleeve length approx 38 cm.